Posted by Bill Mann on Monday, February 4th, 2013 at 6:40pm. Mortgage rates worsened last week amid evidence of an improving economy. Conforming mortgage rates climbed in Coastal Delaware and nationwide, rising to a 4-month high. Freddie Mac has the average 30-year fixed rate mortgage rate at 3.53% for borrowers willing to pay 0.7 discount points plus a full set of closing costs. There was plenty of news on which for rates to move last week. First, the Federal Open Market Committee (FOMC) met and voted to hold the Fed Funds Rate in its current target range near 0.00 percent. The Fed also recommitted to purchasing mortgage-backed securities (MBS) and Treasury securities on the open market until such time as the national Unemployment Rate reaches 6.5%, or until inflation rates rise. Then, Friday, it was shown in the Non-Farm Payrolls report that the national jobless rate had climbed to 7.9 percent, a statistic Wall Street pinned to Hurricane Sandy. In addition, it was shown that 157,000 net new jobs were added to the U.S. economy in January. This was a slight improvement from the month prior's revised figures, and marked the 27th consecutive month of U.S. job growth. Also last week, the National Association of REALTORS® reported the December Pending Home Sales Index to be lower than expected; largely the result of shortages of available homes in many areas. In addition, Durable Orders for December were more than twice what investors expected; a further indication of a strengthening U.S. economy. Lastly, the ISM Index for January surpassed Wall Street's expectations. This manufacturing index is considered an indicator of future inflationary trends. An upward trend in this index suggests rising mortgage rates. 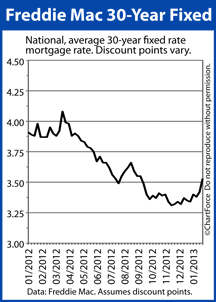 While current mortgage rates remain relatively low, they can be expected to continue rising as the economy improves. This upcoming week will be quieter with fewer economic series scheduled for release. Factory Orders for December will be announced, as will the ISM Services Index and Jobless Claims. Mortgage rates may continue to rise.